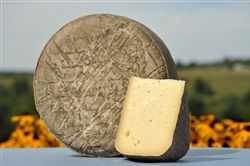 Daisy is a Tomme, cave-aged for approximately 6 months. The original Calkins Creamery produced a cheese named Daisy scores of years ago, and we aim to keep the legend alive wih our modern version. Each sales until contains 1 full pound of cheese, vacuum-sealed. We recommend removing this cheese from the packaging and storing in butcher paper once it makes it home.